Located in San Diego within 3.5 km of SeaWorld San Diego Donnas Mission Beach Retreat offers accommodation with air conditioning. This apartment provides accommodation with a balcony. The apartment has 3 separate bedrooms and includes a kitchen with a dishwasher and a dining area. The bathroom features a hot tub and bath. University of San Diego is 6 km from the apartment. 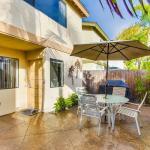 The nearest airport is San Diego International Airport 8 km from Donnas Mission Beach Retreat.